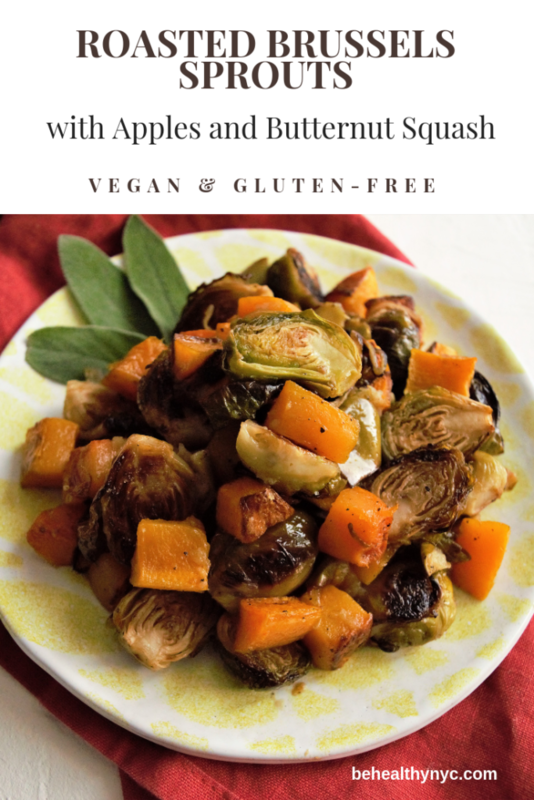 Every year, from October until the end of January I make this roasted brussels sprouts, with apples and butternut squash. 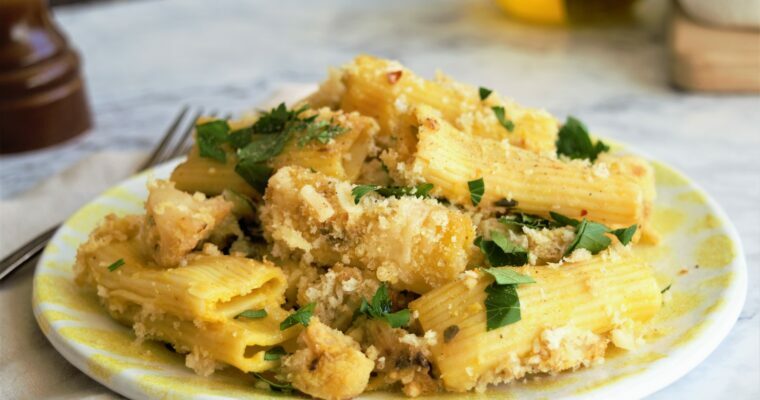 It is one of those traditional and classic holiday side dishes that you just must-have! 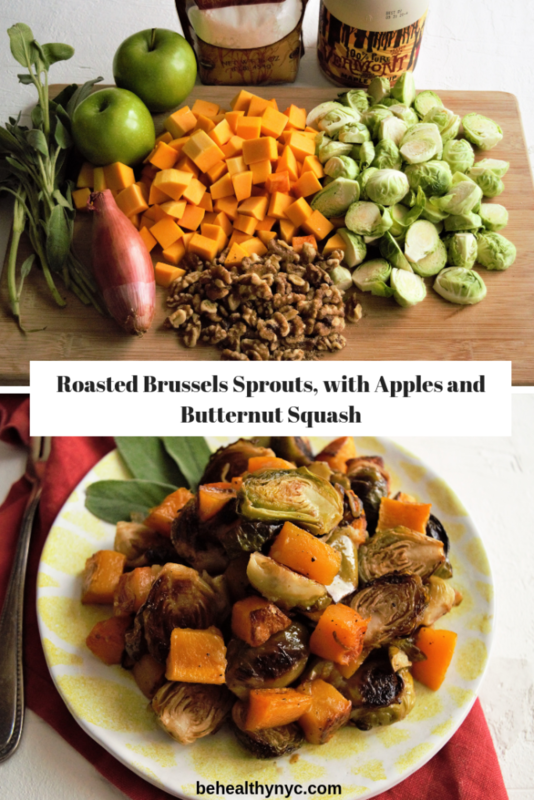 I have dozens of recipes for Brussels sprouts, but this is my favorite for its perfect combination of flavors and textures. Here is the original recipe, however, I sometimes roast the vegetables separately so I can decide how long I will cook them. Another thing that I no longer follow is the candied walnuts; I rarely use processed sugar. Instead, I pan fry the nuts (or bake them with the vegetables, stirring occasionally) with a little coconut oil and maple syrup. A much healthier choice! 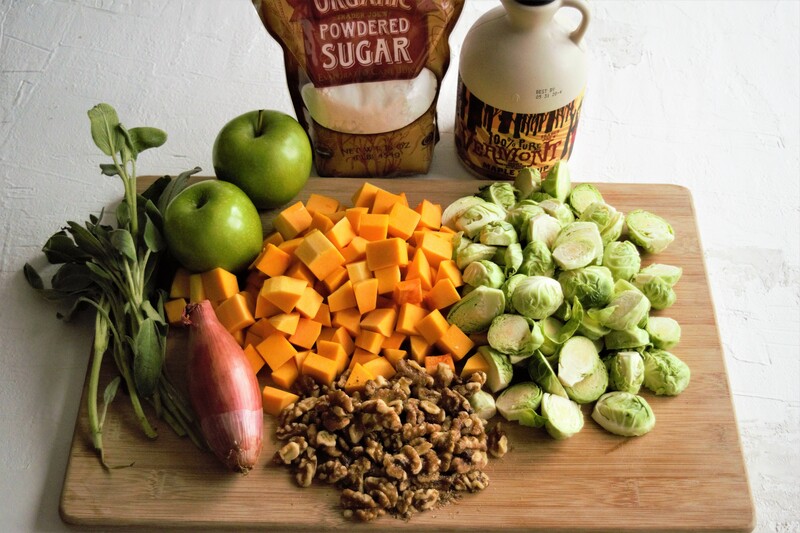 Serve this roasted Brussels sprouts, with apples and butternut squash with vegan stuffing and cranberry sauce. Preheat oven to 375 degrees. 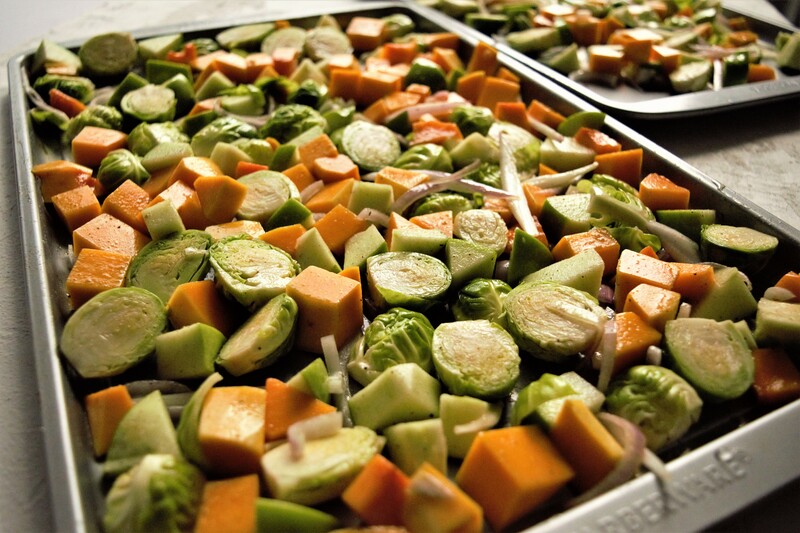 In a large, shallow, baking dish, toss the brussels sprouts, butternut squash, apple and shallot with olive oil and sage leaves. Season with salt and pepper to taste. 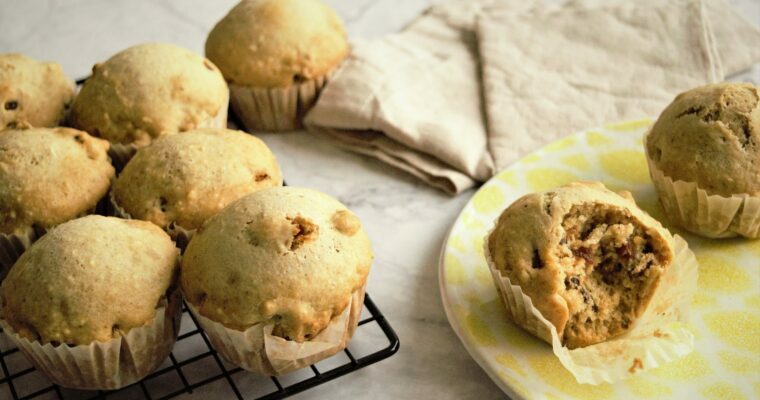 Bake without stirring until vegetables and apple are wrinkled, slightly brown, and the edges of the squash are beginning to crisp, 45 minutes to 1 hour. Meanwhile, prepare the walnuts. For the walnuts: Place a deep fryer or high-sided saucepan over high heat, and add vegetable or canola oil to come no closer than 3 inches from the top of the pot; when walnuts are added the oil will bubble and rise. Heat to 375 degrees. If using a saucepan, reduce heat to very low to hold temperature. In a medium pot over high heat, bring 4 cups water to a boil. Add walnuts and boil for 10 seconds. Drain well and immediately toss with confectioners’ sugar. Spread flat on a baking sheet and allow to dry for a few minutes. Have a baking sheet lined with paper towels nearby. Working in batches if necessary, add walnuts to oil and stir once or twice. Fry until amber-brown, about 30 seconds. Using a wire skimmer or heatproof slotted spoon, remove walnuts from oil, and transfer to paper towels. Sprinkle lightly with salt and allow to cool for 5 minutes before handling. May be stored in an airtight container at room temperature for up to three days. To serve: Remove vegetables from oven, drizzle with maple syrup and sprinkle with 2 to 3 tablespoons of halved or roughly crumbled walnut pieces. Every oven has its personality, and I find it hard to trust the suggested time on most recipes. My oven has a sensitive side (the left corner), and I have to a keep an eye on vegetables, rotating the pan and tossing them from time to time. In this recipe, the shallots cook fast, so I like adding them after about 20 minutes, with the apples, this way they won’t burn. Tossing the apples can be dangerous as they are so delicate and break easily, so I put parchment paper on the baking sheets because it makes the tossing easier. So when I roast the vegetables separately, I can see if it is time to take the apples and shallots out. Step 1: Preheat oven to 375 degrees. 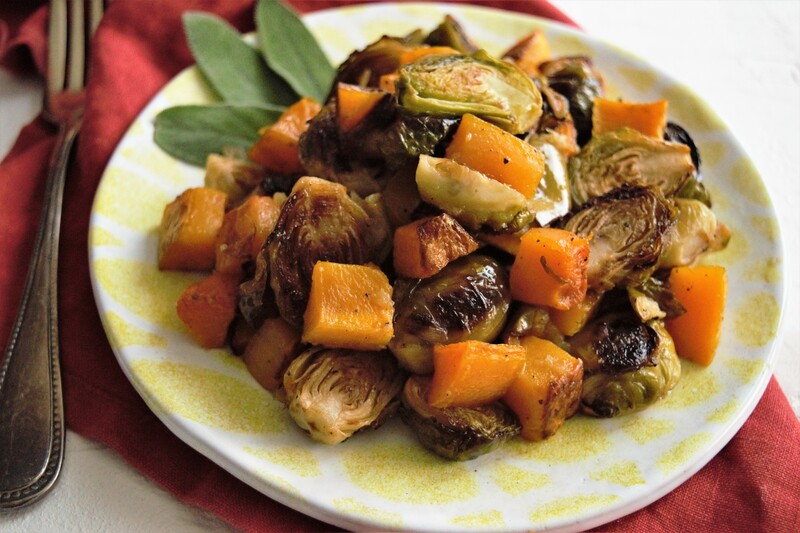 In a large, shallow, baking dish, toss the Brussels sprouts, butternut squash, apple and shallot with olive oil and sage leaves. Season with salt and pepper to taste. 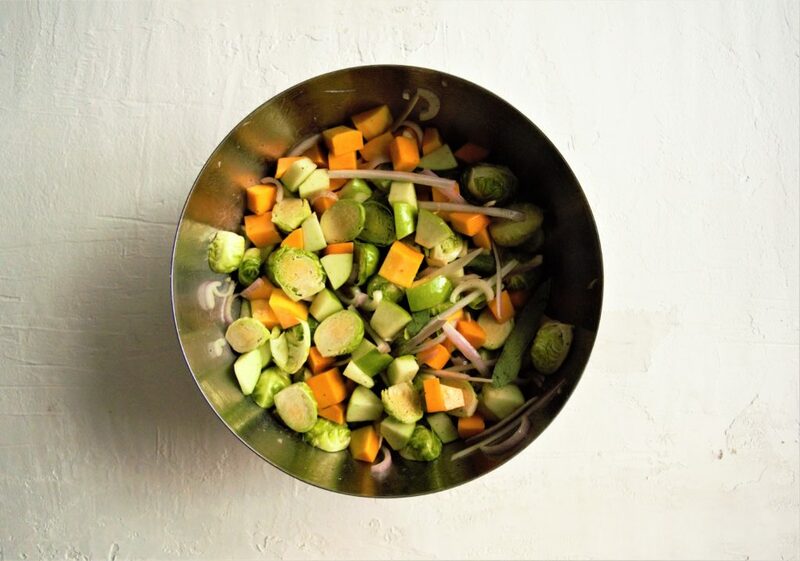 Bake without stirring until vegetables and apple are wrinkled, slightly brown, and the edges of the squash are beginning to crisp, 45 minutes to 1 hour. Meanwhile, prepare the walnuts. Step 2: For the walnuts: Place a deep fryer or high-sided saucepan over high heat, and add vegetable or canola oil to come no closer than 3 inches from the top of the pot; when walnuts are added the oil will bubble and rise. Heat to 375 degrees. If using a saucepan, reduce heat to very low to hold temperature. Step 3: In a medium pot over high heat, bring 4 cups water to a boil. Add walnuts and boil for 10 seconds. Drain well and immediately toss with confectioners’ sugar. Spread flat on a baking sheet and allow to dry for a few minutes. Step 4: Have a baking sheet lined with paper towels nearby. Working in batches if necessary, add walnuts to oil and stir once or twice. Fry until amber-brown, about 30 seconds. Using a wire skimmer or heatproof slotted spoon, remove walnuts from oil, and transfer to paper towels. Sprinkle lightly with salt and allow to cool for 5 minutes before handling. May be stored in an airtight container at room temperature for up to three days. To serve: Remove vegetables from oven, drizzle with maple syrup and sprinkle with 2 to 3 tablespoons of halved or roughly crumbled walnut pieces. Wonderful! Your whole family will love it!